Apple finally discontinued the iPod Classic. The iPod Classic in all its glory. 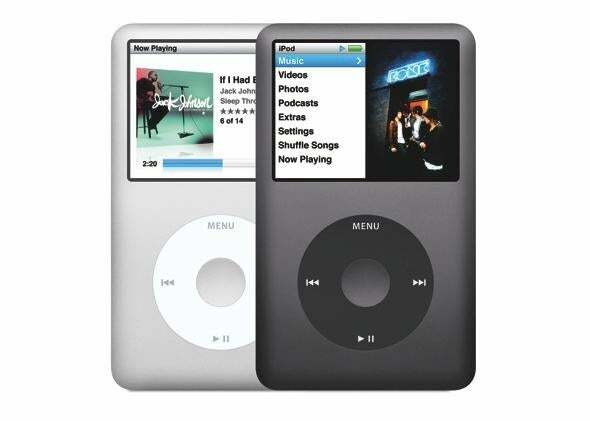 After Apple made a series of iPhone and Apple Watch announcements on Tuesday, people started noticing that one product was missing from the company’s website: the iPod Classic. One of the last vestiges of the pre-touchscreen iPod age, the iPod Classic was once just the iPod. When it debuted in October 2001, it had a 5 GB hard drive to store 1,000 songs and a click wheel that actually spun. It transformed over the years, peaking at 160 GB and gaining the “Classic” suffix. And now it’s gone. Rumors of the Classic’s demise began in 2011, but the unobtrusive device held on for years. And with the debut of the Apple Watch, its death seems almost poignant. A new era for Apple, or at least that’s the narrative the company is pushing. Just as the Apple Watch faces a mixture of praise and criticism, the iPod was once dogged by skeptics. As you mourn the iPod Classic today, let these comments from 2001 (surfaced by photographer Dan Kim) lighten your heavy heart. This is not like any other MP3 player on the market, imagine being able to store several days worth of music at once! The iPod will be great for travelers, students, heck anyone who is really into music. Mmmm. APPL is already down $1.00 … Looks like the markets aren’t looking too favorably on Apple’s new forays into the digital device market. Am I the only one who sees a fatal flaw with this “consumer” device… IT’S MAC-ONLY!